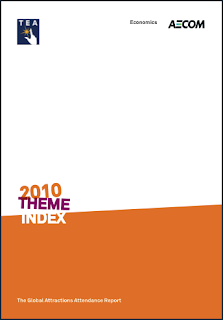 The 2010 Theme Index, published jointly by the Themed Entertainment Association and AECOM, has been released. The report not only gives a look at specific park attendance figures for 2010, but also provides some commentary on the highs and lows of the year. The good news is that the report finds that attendance levels at parks in North America are coming close to pre-recession levels, something most didn't think would happen so soon. Hopefully the momentum that parks have going will carry on through 2011. The park with the most attendance in the world continues to be the Magic Kingdom at Disney World, with just shy of 17 million visitors.